Canned Indian simmering sauce beats home cooked Indian recipe!!! Yep, that's what happened here. I still think about that fabulous Chicken Tikka Masala that I made with a jar of simmering sauce from Williams-Sonoma. It was that good. 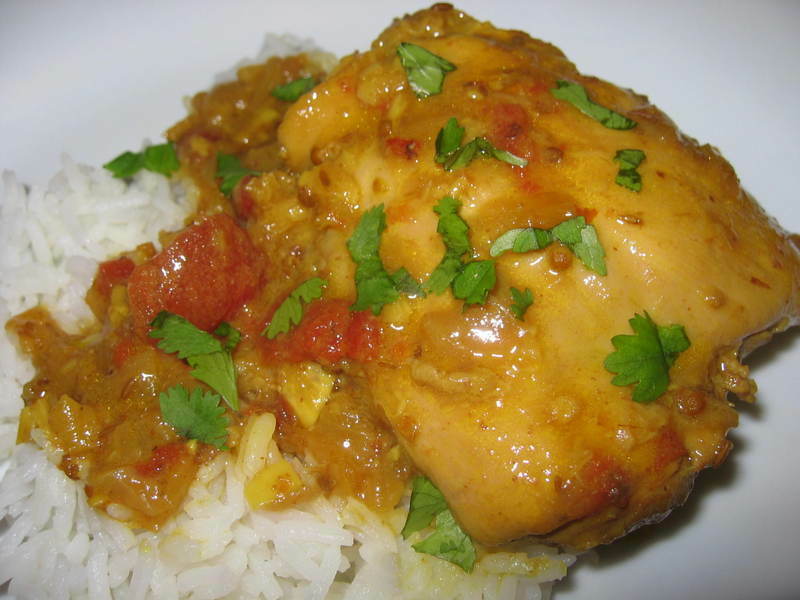 So, I decided to make this recipe of Chicken in Spice Laden Coconut Sauce, because it seemed like it might taste a lot like the Tikka Masala. Well, what can I say? While this was a good dish, it just didn't match my Chicken Tikka Masala nostalgia. And I made this recipe from scratch! Is it because I don't have a spice mill and used my mortar and pestle to pound the spices? Isn't it supposed to be more virtuous to pound them by hand? What did people do before there were spice mills? Whatever. I'm going to Willams-Sonoma and buy more of that simmering sauce. Well, that may not be the most appetizing picture, but it's quite an accomplishment when you consider that I couldn't see what I was doing when I cooked or photographed it. This morning I saw Nigella Lawson on the Today Show making a dish called Bang Bang Chicken while she talked about her new series on The Food Network. Extreme elation ensued! I've been wondering when she would be back on television. 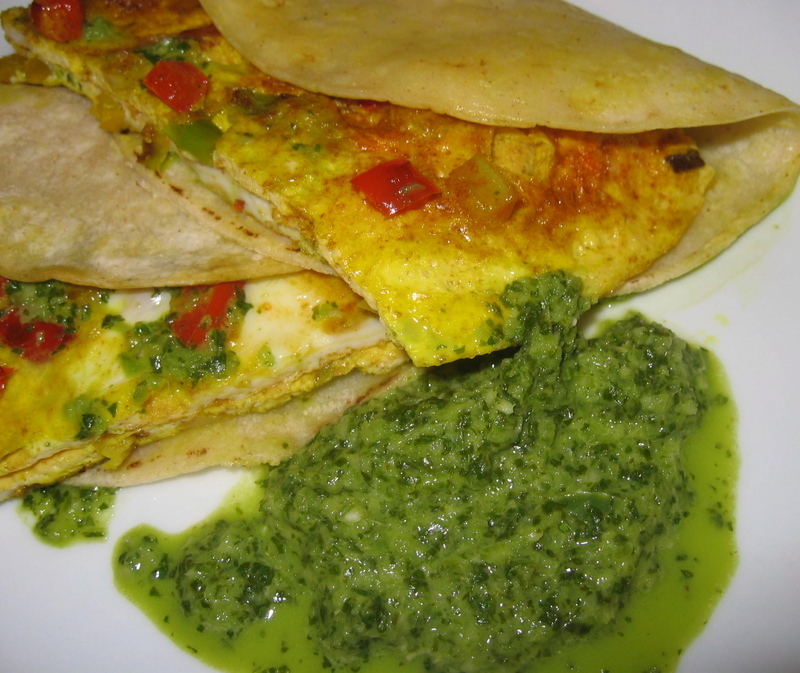 So, I decided to make her recipe, Green Cilantro Chutney and Omelet Masala, for Weekend Herb Blogging. Unfortunately, I had a late afternoon appointment for an eye exam, where my eyes were dilated, and it wound up causing me to see everything in a sort of colorful haze. Please go over to the lovely Kalyn's site and see what the other Weekend Bloggers have cooked up for your enjoyment. You'll be glad you did! Several days before my little jaunt to the hospital, I fixed a delicious dish using a jar of Tikka Masala Indian Simmering Sauce. I've never used this product, but was very surprised at how good it tasted. Nancy bought it at Williams-Sonoma and tucked it into my Easter basket, for which I'm eternally grateful. I love finding something that lets me make a wonderful meal, with almost no effort. I have to say, the smell of the sauce as it was cooking was heaven. To my mind cumin, coriander seeds, ginger and garlic produce an aroma that can't be beat. I hoped the dish would taste as good as it smelled, and it did. It's Weekend Herb Blogging, an event hosted by the lovely Kalyn at her site Kalyn's Kitchen. Go there and meet the other herb bloggers. My entry is a wonderful Asian-Spiced Kedgeree devised by Nigella Lawson. Maybe it was the fact that I was genuinely famished when I fixed this meal that made me love it so much. I don't think so. But, I'll gladly make it again when I'm not so hungry, as a test to see if it's really as sensational as I thought while eating it. There are some foods that give you greater pleasure than you expect, and this was one of them. 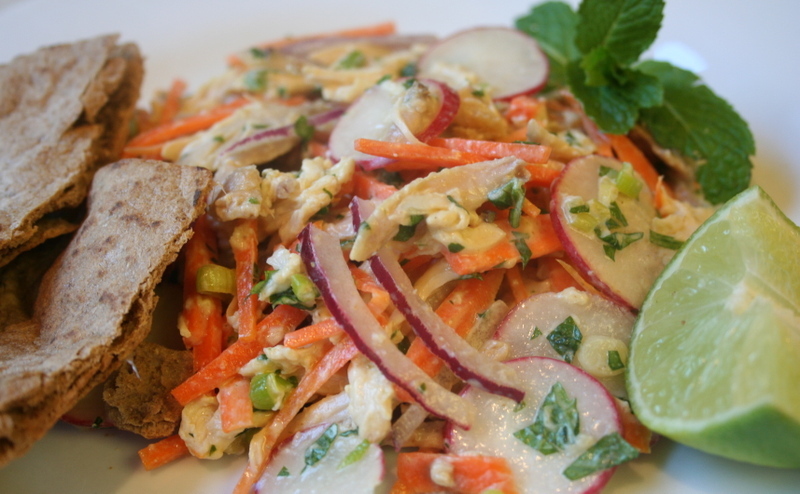 First off, it has coriander, cumin, cilantro, and fish sauce, flavors that I truly love. And there's the rice and the salmon, which I eat very often. So, I expected to like it. But, this was better than I thought it would be. It was an instant comfort food. Or maybe it was the hunger? Naaaah. It was fabulous.